Oh, Donna, I love your Halloween card. It really has a lovely glow about it. The city stamp is gorgeous as is the technique that gives off that hazy glow. Nice work.. This is a fabulous card. It really does look like she is flying over the city. I love that witch image and your coloring is awesome. Thanks for playing with us this week at Hand Stamped Sentiments! wow donna what a great looking card, love how you did this. beautiful done and great stamps. This is a fabulous card, Donna! As always, you make the most gorgeous scene cards! Love it! It is beautiful. Just love what you did to it. Donna, This is so stunning,I love it! Wow - love that 'Old London' stamp. 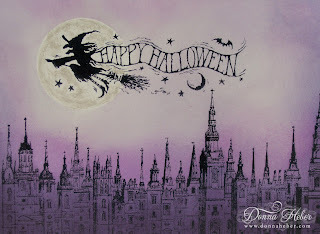 The witch is fab flying over - sponging looks great. Fantastic card!! I love both of those stamps!! The moon looks great too. Wonderful as always. I LOVE THE COLOR, JUST PERFECT. HAVE A NICE DAY. 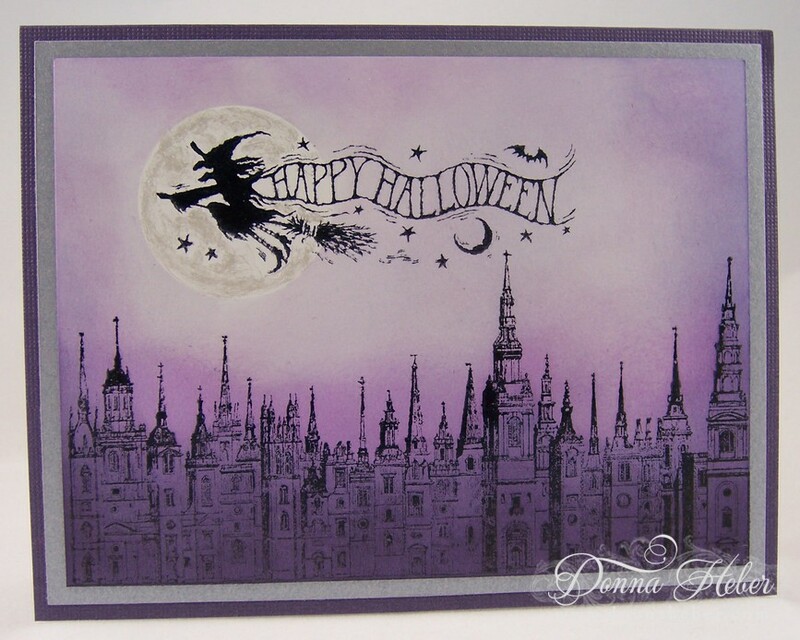 Perfect Halloween card Donna! LOVE the shimmer and the night scape scene, beautiful. Thank you for joining us at hand Stamped Sentiments this week. OH! The Old London City stamp is beautiful! I like the moon, the color, the sentiment, & also the witch! WOW, your London skyline and that moon!!! OOOOOh, I love it!! :) Wonderful card and thank you for your sweet comment! Gorgeous card. The witch stamps is a favorite of mine. Can't post with my google account for some reason. This is very cool.....love that skyline! I have never heard of those stamps, I'll have to check them out! Fabulous card, Donna! I love that London scene with the witch. Great moon, too! You did a great job with the sky and the colors are perfect. It's a very elegant card especially with the shimmer. Thanks for playing at Hand Stamped Sentiments. This card is gorgeous! Your sponging is AMAZING and soooo spooky! Thanks so much for playing with us at Hand Stamped Sentiments this week! This is a great card. I love the colors and I bet the sparkle looks so great in person. Great job! Thank you for joining us at Hand Stamped Sentiments. Awesome! Love the pairing of these stamps, ingenious!